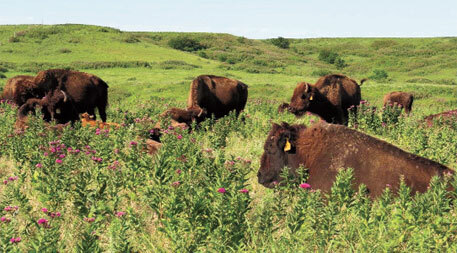 THE tallgrass prairies of North America have rich fertile soil and have been ravaged for cultivation for centuries. Restoration efforts are now under way in many parts and in one such initiativeÃ”Ã‡Ãªa research team led by the University of Colorado Boulder, US, has for the first time focused on analysing the prairie soils. Researchers explored the microbial diversity in the soils of the undisturbed areas of tallgrass prairies and found a poorly understood bacteria belonging to Verrucomicrobia phylum which dominated the rich soils. “This is our first glimpse into what might have existed across the whole range,” says Noah Fierer, associate professor of microbial ecology at University of Colorado and lead author of the study. “These soils played a big role in American history because they were so incredibly productive,” he says. The researchers say that due to the prairie’s significance, several attempts have been made in the past to predict the distribution of plants and animals in theÃ”Ã‡Ãªprairie ecosystem. However, there have been no attempts to reconstruct microbial diversity. The scientists say that the ecosystem once covered nearly 10 per cent of the contiguous United States (>65 million ha) but has now been reduced to a small fraction of its extent. Cultivation and row crop agriculture, now practised across most of the tallgrass prairie biome has not only replaced species-rich plant communities with monoculture croplands, but has also drastically altered the physicochemical and biological characteristics of the prairie soils. The soils currently found throughout the region bear little resemblance to their pre-agricultural state. For the study, researchers collected soil samples of prairies from 31 remnant native sites that were found mostly in cemeteries and nature preserves. DNA sequencing was employed to characterise microbial species in different soil samples. The researchers found that the biogeographical patterns were largely driven by changes in the relative abundance of Verrucomicrobia. In a perspective on the study that was published in Science, Mary C Scholes,Ã”Ã‡Ãªprofessor at the University of the Witwatersrand, Johannesburg, and Robert JÃ”Ã‡ÃªScholes, scientist at the Council for Scientific and Industrial Research, Pretoria, South Africa, stress on the importance of preserving soils. “Even in advanced economies, human well-being depends on looking after the soil. An intact, self-restoring soil ecosystem is essential, especially in times of climate stress,” say the experts. The Scholes report that agricultural activities account for one-third of greenhouse gas emissionsÃ”Ã‡Ãªwhich originate mostly from the soil due to the use of chemicals and fertilizers. They say that restoring soil biological processes will help provide lasting food and environmental security.